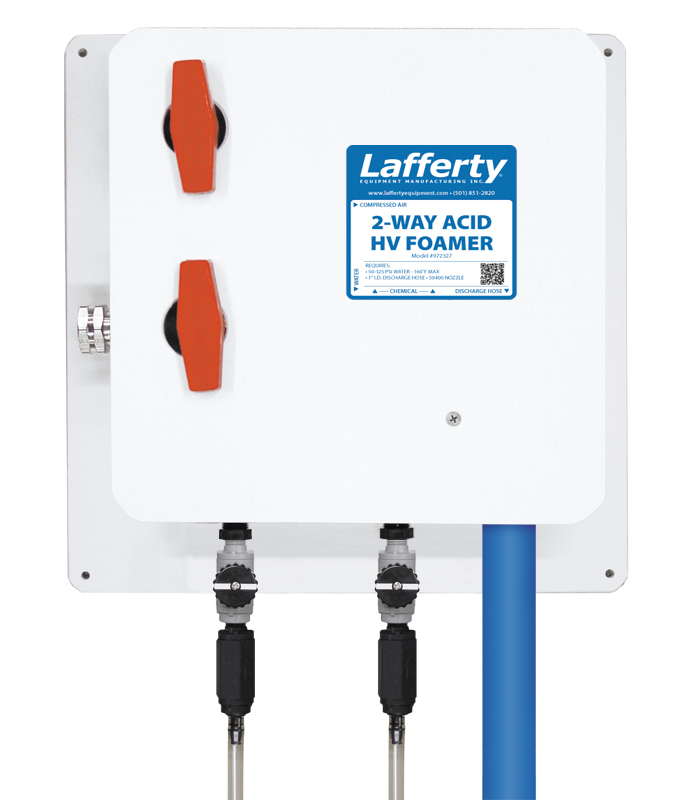 2-Way Acid HV Foamer | Lafferty Equipment Manufacturing, Inc. The 2-Way Acid HV Foamer is a high volume foam applicator for applying 2 highly corrosive chemicals such as those used to remove concrete and for aluminum brightening. This acid-resistant venturi injection system uses standard city water pressure (40 - 125 PSI) to draw and blend concentrated acid into the water stream to create a highly concentrated and accurately diluted solution. A high volume of rich, clinging foam is created by injecting compressed air into the solution to greatly increase volume and coverage ability. The foam is then projected through the discharge hose, extended wand and fan nozzle at distances up to 15 feet (25 feet with zero degree nozzle). Use the chemical ball valves to inject the 2 chemicals separately or simultaneously.